Origin and Habitat: South America, widespread in several river systems in Peru, Colombia, Venezuela, French Guyana, Brazil, Paraguay, Uruguay and Argentina. Occurs in slow-moving waters containing cover in the form of sunken branches and logs, with a mud or sand substrate. The type locality of the fish initially described by Agassiz was incorrectly published as the Atlantic Ocean; this species is strictly freshwater. Most fish available in the hobby will be commercially raised or from local breeders. 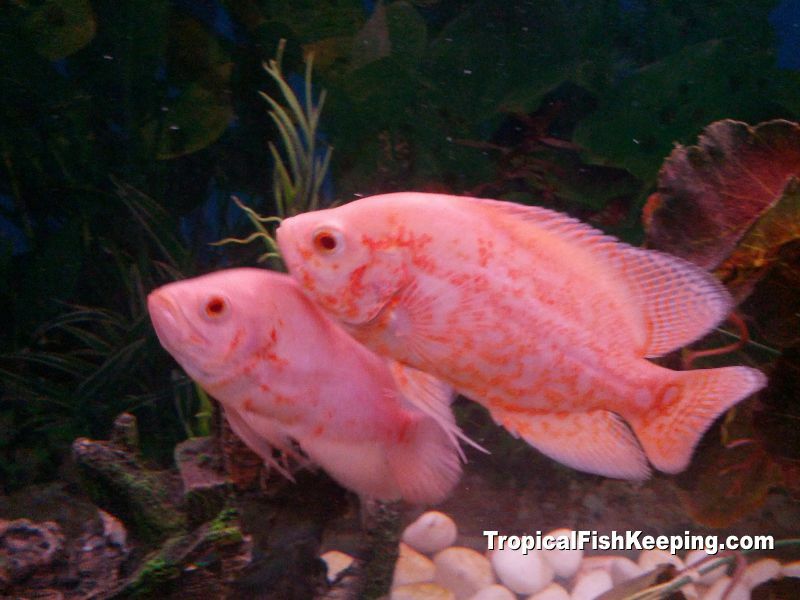 Compatibility/Temperament: While fish are gregarious at the juvenile stage, they will eat fishes smaller than themselves as they mature and are often intolerant of tankmates as adults. Should be maintained singly or as a mated pair. Additional fish require very much larger tanks. 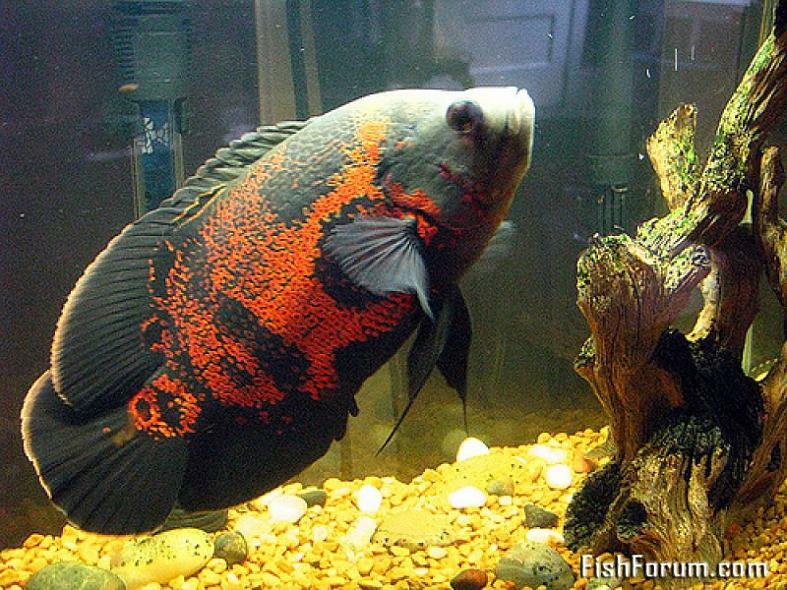 This is not a community fish for most home aquaria. A natural predator, in the wild it eats fish, worms, insects, crustaceans, plankton and vegetation. 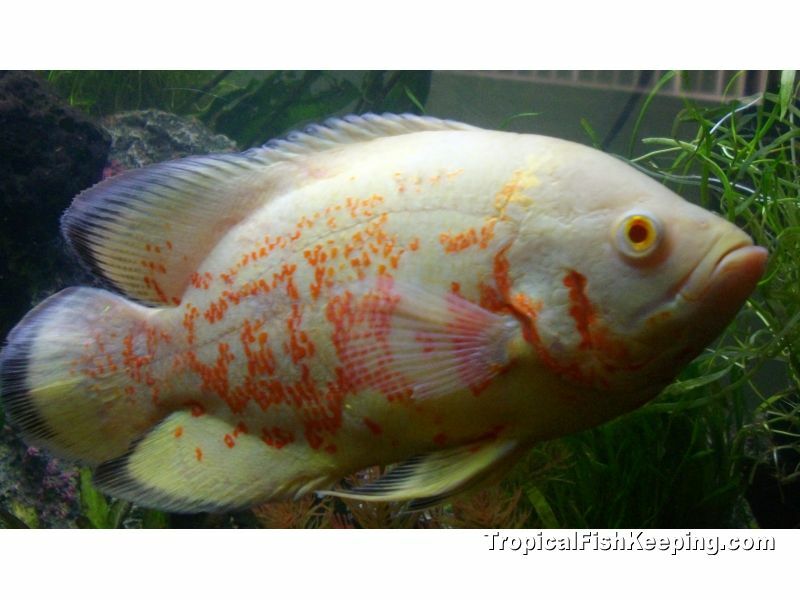 Although it is advised to vary an Oscars diet, using cichlid pellets as a staple will bring forth the most success. Can also offer frozen krill, shrimp,chopped earthworms,and feezedried crickets. Live earthworms for larger fish as treats. 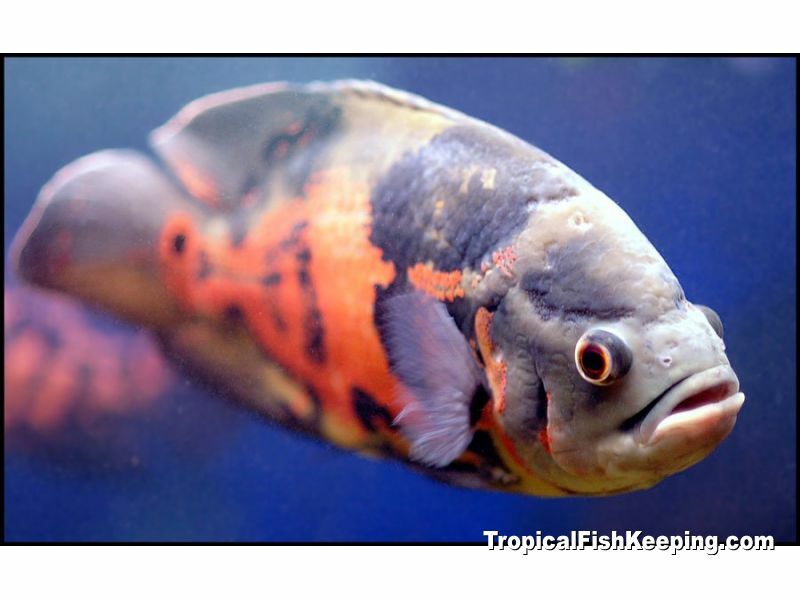 Store bought feeder fish should not be offered for they are often diseased due in large part to poor conditions they are kept in and are poor nutritionally by comparison to prepared foods. 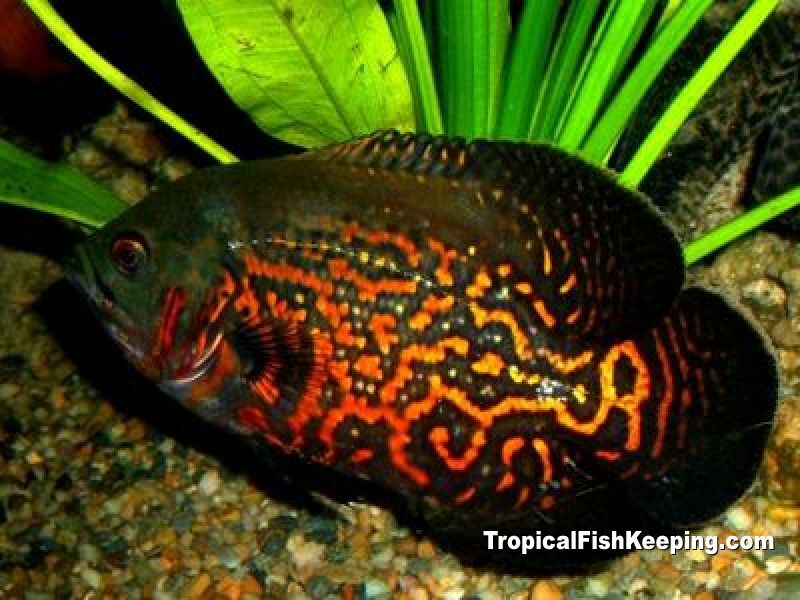 Maximum length 45cm/18 inches, usually around 30cm/12 inches in aquaria. A healthy Oscar will grow at a rate of approx one inch per month with proper care. 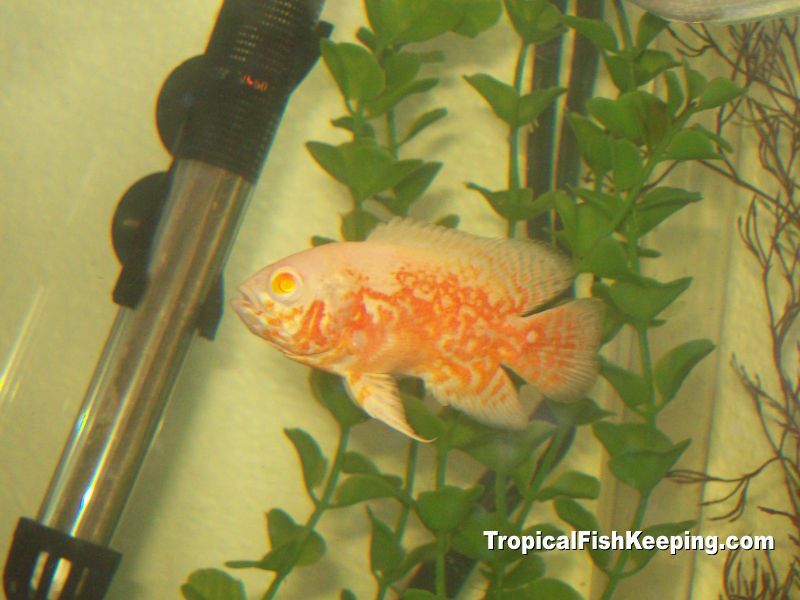 75 gallons for one Oscar. Soft to medium hard (5 to 19 dGH), slightly acidic to basic (pH 6 to 8), temperature 22-25C/71-77F. Higher temperatures (to 28C/82F) are tolerated but not recommended. Nitrate levels should be kept to a minimum with regular (weekly) partial water changes. The original wild species is rarely seen in the hobby. 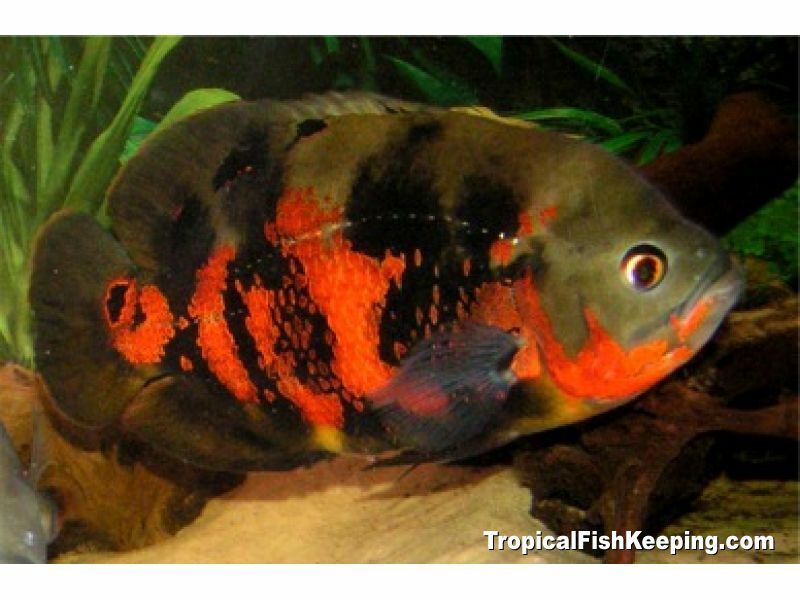 The fish comes in a wide variety of colors and patterns selectively bred for the aquarium trade such as Tiger, Black, Albino, Zebra, Red and Fire Red. A long fin version is also available. A suitable aquascape could consist of a sand or fine gravel substrate, with large chunks of bogwood and branches. 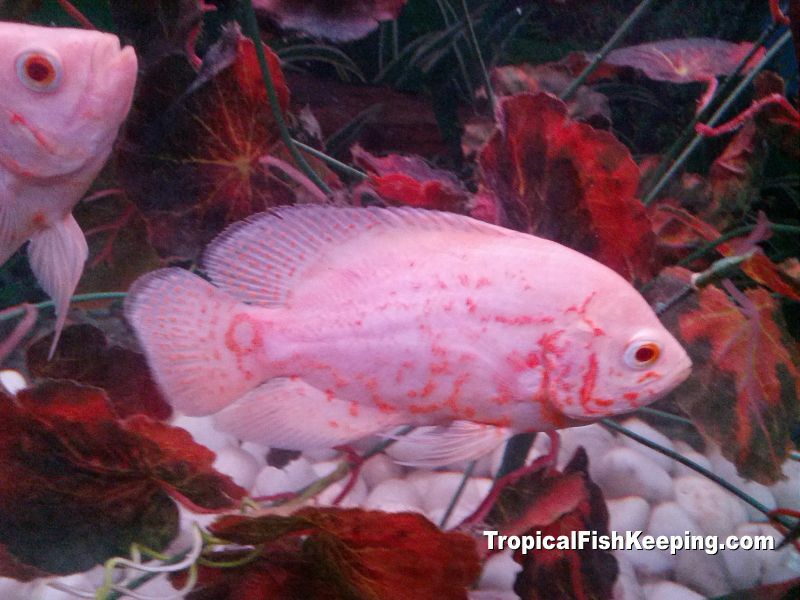 This fish likes to rearrange its environment, so plants will not usually survive, and some may be eaten. Strong currents are not advisable, but the filtration must have a good turnover, six to eight times the volume of water the tank holds each hour. Example, for a 75 gallon tank, 600 gallons per hour. Chunks of wood can be used to divert the filter outflow for a calmer tank. Breeding is easy, but discerning the male/female is not easy since they are nearly identical externally. The fish will be able to spawn at approximately five inches in length. A small group of fish can be allowed to pair themselves; once this occurs, all fish except the chosen pair must be removed. The spawning tank should be no less than 5 feet in length by 2 feet in width, and include flat rocks as this species is a substrate spawner. Captive Oscars will live 10-20 years. The species was described in 1831 as Lobotes ocellatus by the zoologist and founder of Harvard University's Museum of Comparative Zoology, Jean Louis Rodolphe Agassiz. Lobotes is a genus of marine fish closely related to the cichlidae, and the locality of the type specimen [since lost] was published as the Atlantic Ocean, an error that was corrected by Kullander in 1986. The species epithet is the Latin adjective meaning "with little eyes," a reference to the ocelli [eye spots] on the base of the dorsal fin. The species was transferred into the present genus in 1980 by D.S. Lee, C.R.Gilbert and others in their "Atlas of North American Freshwater Fishes." There is at present only one other species in the genus, A. crassipinnis, a smaller fish attaining nine inches and lacking the ocelli (eye spots) on the caudal fin. Perhaps because of the extensive natural range of this species, it was described and assigned five other names between 1843 and 1911. Kullander (1986, 2003) determined these fish were all conspecific [same species] so the names become synonyms of the subject species, although he suggests that with further study of additional wild populations some of the names may need to be rehabilitated for distinct species, or some may be found to refer to A. crassipinnis. Kullander, Sven O. (1986), Cichlid fishes of the Amazon River drainage of Peru, Swedish Museum of Natural History. Kullander, Sven O. (2003), in Reis, R.E., S.O. Kullander, and C.J. Ferraris, Jr. (eds), Check list of the freshwater fishes of South and Central America, 2003. Last edited by TFK Team; 05-27-2013 at 06:01 PM.